ADDED: “Nous sommes dans un pot de chambre, et nous y serons emmerdes.” Gen. Ducrot, Sedan, France, Aug. 31, 1870. As we come to the close of the year I’d like to again thank Meister Bloom for the opportunity to write here, and recognize the wealth of talent and intelligence gathered on this most excellent blog. One of the earliest successful “machine guns”, this excellent and ingenious weapon was developed by the French in the 1860s, just in time to be deployed in the so-called “Franco-Prussian” War of 1870-1; the result of which, for the French, was one of the greatest military defeats in history (eerily repeated in 1940, but let’s take it one war at a time). 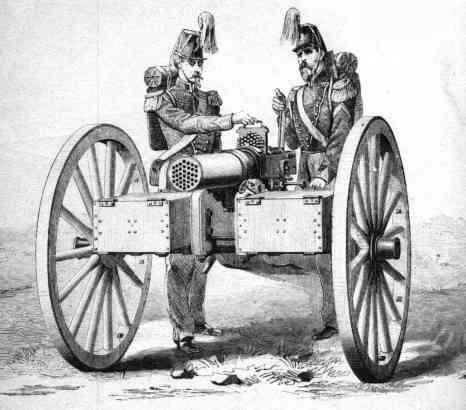 The Emperor [Napoleon III]…also had the mitrailleuse. With this he had been experimenting since 1860, and production had begun under conditions of great secrecy in 1866. In appearance it resembled the fasces of the Roman Lictors: a bundle of twenty-five barrels, each detonated in turn by turning a handle. It had a range of nearly 2,000 yards and a rate of fire of nearly 150 rounds per minute…but such secrecy surrounded its manufacture that training in its use was almost out of the question, and no useful discussion was possible about how it should be employed. English atheists … often have minds befuddled by a world view which is little other than the old, ranting, Fox’s-Martyrs-in-a-sauce-of-Charles-Kingsley-with-a-dash-of-Kensit Protestantism, all in the reassuring clothing of a friendly atheistical sheep. Mark pointed out to me recently that Murray Rothbard had similar thoughts about how postwar secular morality is essentially a kind of godless protestantism, but “Rothbardian” seems to mean a different thing these days. There is a reason why many notable conservative thinkers hold the concept of ideology in low regard. Often times, ideologues, so married to their ideas of right and wrong, make grand propositions to showcase their intellectual superiority and flair for dramatics. The ideologue’s job is rarely the search for truth but instead to turn philosophy into a dazzling light show. At least that’s my take on a recent screed in the Jacobin titled simply “Abolish the Senate.” Given that the piece appears in one of the most radical leftist periodicals in America, I expected hyperbole. But the article, written by journalist Daniel Lazare, surprises in its lack of thoughtfulness and overuse of dog whistles meant to inspire base anger in progressive readers. So what exactly is wrong with abolishing the Senate, an institution 225 years of age? As a Nockian, I’m inclined to endorse the sentiment. Representative democracy on a large scale is hogwash and deserves a good axing. Unfortunately, history warns against such radicalism, and shows us that revolutionary calls to action are often sown with the seeds of complete societal upheaval. That’s not exactly my cup of tea. Hence I’m not so keen on pushing the proverbial button and abolishing the much-maligned state in one fell swoop, including the Senate. Perhaps one day we’ll get there, though it’s doubtful. Back to the piece, Lazare is adamant about tossing out what Washington called the saucer that cools the populist longings of the House of Representatives. His reasoning is simple: the current United States Senate is “one of the world’s most undemocratic legislatures.” How so? The men and women who make up the legislative body are disproportionately representative of the country. The millions who live in New York City essentially have the same amount of votes as the half-million hicks that reside in Wyoming. And that just ain’t fair. The problem of finding a job turned out to be rather more difficult than I had expected. I called my friend Howard Myers, the Architectural Forum’s editor and publisher, as soon as I got off the boat and dropped by to see him the next day. He was full of enthusiasm — but there seemed to be something wrong. Finally, he came to the point: I had written several letters to him from Germany during my stint as an intelligence officer there, and some of these letters dealt with the sobering encounters I had with our Soviet allies, both in the last weeks of the war, when my armored division was on the Elbe River, and in the months following the German surrender, when much of my work brought me in contact with various forms of Soviet oppression throughout Eastern Europe. “I showed your letters to some of the people on our editorial staff,” Howard told me, “and I couldn’t believe my ears — they told me that it would be ‘disruptive’ of staff morale if you came back, in the light of your political views!” Howard still seemed in a state of shock as he tried to explain. He was quite naive politically and quite unaware of what many of us knew only too well, and from bitter personal experience: that the journalists’ union, known as the Newspaper Guild, was — in New York, at least — under full control of Communist Party members and their fellow travelers; and that the Time Inc. chapter, in which several of the top Forum editors were extremely active, was notorious for its rigid adherence to the party line. Not until a couple of years later, after some bloody internal battles, did the membership of the Newspaper Guild overturn its Stalinist leadership. But for no particular reason I decided to read a few reviews first, starting with Roger Kimball’s in the New Criterion from 1994, which shows up second in the Google results for the book. It seems to be a remarkable and not particularly review-like piece of writing; Kimball complains that Blake doesn’t have the right facts about public school funding and views about Republican presidents. Mr. Blake speaks of his school’s “atmosphere of socialist euphoria.” It is an aroma that permeates his book. The real problem with No Place Like Utopia, however—the thing that ultimately derails it as a serious book about the architecture of the period—is Mr. Blake’s extraordinarily naïve stance as an anti-capitalist crusader and his embrace of utopian socialist politics. Initially, the title of this book was to have been When Utopia Was Young, and that title was to have implied a decline in modern architecture and modern art over the past fifty years or so. Or a decline in the idealism that motivated so many of us when we started out. For various reasons I decided to change that original title — but the original message, alas, has remained unchanged … The loss of idealism that concerns me in this book is perhaps more fundamental. It seems to me that the generation of young architects who, like myself, came out of World War II, was motivated by certain passions: we were determined to change the world, nothing less. We realized that mankind was faced by all sorts of predictable disasters … We believed, quite sincerely, that modern architecture could do something about all these things — especially about housing the poor, and about creating viable, healthy, democratic (and incidentally, beautiful) communities. We believed that we could slay the automobile, defeat fascism, and abolish disease. We were starry-eyed, and beautifully naive. Does it sound like he’s failing to scrutinize his socialist past, to you? All of these notions [of the three professors] suggested, or at least implied, the establishment of a planned society. But while Mies had briefly flirted with socialism in the early 1920s, neither he nor Bucky nor Konrad Wachsmann seemed to have any special interest in radical politics when I met them in the years after the war. Still, it seemed clear to me that they assumed, without ever bothering to pursue the notion, that some sort of planned society would have to be established … The fact that there seemed not the slightest intention in America to establish a planned society in the traditional Marxist sense, didn’t seem to have been noticed by any of them, or by any of the other avant-garde architect and planners demanding to be heard. Yet clearly the fact that American free enterprise, with its dedication to unfettered chaos, was in no immediate danger of overthrow would profoundly challenge many basic assumptions made by the avant-gardists. For example, it would become clear that unplanned, chaotic free-enterprise competition was infinitely more productive than planned order of the sort implied or assumed by the avant-garde; that it would produce a kind of cityscape — colorful, varied, chaotic, without any semblance of order — that might be infinitely more stimulating than the deadly visions of Ideal Cities drawn up, painstakingly and humorlessly, by the bureaucratic Hilbs and his driven disciples; and that unfettered competition, in housing and in all other forms of construction, might well produce qualitative advances in areas that really mattered to ordinary people (for example, efficient kitchens, sleek bathrooms, compact laundries)., and that would outpace anything and everything produced by single-minded socialist planners. And it would further become clear that a democratic, egalitarian society — as opposed don an elitist, authoritarian order — might produce a very different urban and suburban image of itself than that imagined and built by the kings of France and Prussia and the princes and dukes of Italy; that an ordered society — however rational, however logical, however seemingly productive of a more humane environment — was hardly expressive of the kind of chaotic, creative anarchy represented by American capitalism. None of this, I suspect, ever occurred to the leaders of the post-war avant garde — at least notuntil the 1960s, when such ideas began to surface in the writings of Jane Jacobs and Robert Venturi. It certainly did not occur to me until I had been exposed to their ideas. Who reads this and thinks, ‘well, sounds alright, but look what he thinks about Ronald Reagan!’? Apropos of nothing, this is a great read. A piece I wrote on Gamergate back in September went viral. It called the defeat of Gamergate inevitable because of the forces of cultural inertia stacked against it. The actual outcome was in some ways predictable, but otherwise quite surprising. I attributed Gamergate losing to a phenomenon that in fact did come to pass. The groovy media intelligentsia did everything in its power to paint Gamergate as a simultaneously laughable yet dangerous hate movement that exposed male geeks as crypto-Nazis. To any normally socialized and status-conscious type of person, the media gambit would have led to the spiral of silence that I foresaw. The important factor here is that geeks, by definition, are not normally socialized and status-conscious people. This is particularly true when speaking ex cathedra from their identity as geeks; the threat of looking uncool doesn’t work because they are already uncool. They are already pariahs with ‘lame’ hobbies. Media elites and uncool nerds are two fundamentally different types of people. Every single dominant cultural institution was stacked against Gamergate. Nobody had the intellectual bravery to side with a movement that was apparently just bitter nerds being prejudiced. Gamergate was rapidly becoming a dirty word in the mouths of anyone concerned with looking sensitive and enlightened. Thousands upon thousands, armed with roughly zero information on the controversy, were tripping over each other to signal their righteous “socially aware” status. “Misogynerds” were in the crosshairs. And to their credit, the geeks came out pretty unscathed. Only through their tenacity and lack of concern with their image did Gamergate not get nuked from the chic heights of media that stooped to notice it. The desperately fashionable media displayed its contempt for nerds for “not being with the program.” The problem is that they only had a little less contempt before this fiasco. This is just another example of the people in media, entertainment and academia having a values dissonance with pretty much everyone else. That’s what a cultural elite is – a set of people with values not necessarily shared by the general public, but with a near-monopoly on cultural soapboxes to promulgate their ideas. An endless life of love. Where parting comes no more.